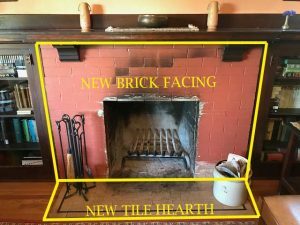 NE Portland Fireplace Remodel- Check out this amazing transformation! 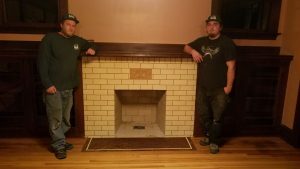 “When we began the project we really did not truly understand the serious fire hazard the old firebox posed or the weakened condition of the chimney. We had even less of a concept of how involved the rebuild project would be. But, Jake & Robert were great to work with and we thank them very much for the long, difficult and dirty hours they put into the project. Their craftsmanship shines through”. We rebuilt the chimney above the roofline and installed a 25′ stainless steel liner to safely vent this wood burning fireplace. The homeowners hand selected tile from Pratt & Larson and Jake and Robert followed the homeowners design and layout with beautiful artistry. If you have a fireplace that needs an update, call us today!